Council is a deep and effective communication practice which has been used for generations, traditionally in indigenous cultures. In its simplest form, Council involves a group of people gathered in a circle (representing the circle of life) for a conversation about a specific topic. Each person within the circle is given an opportunity to share spontaneously with the whole council, while being attentively and respectfully listened to, without judgement by all members. It is important to feel safe enough to share our heartfelt truths without the fear of judgement and gossip. A commitment to integrity and confidentiality creates a safe and accepting place to express ourselves. Sharing during Council is always optional. The practice of Council is used widely in schools, communities, businesses, restorative justice, and many other settings as a means of powerful and insightful communication. 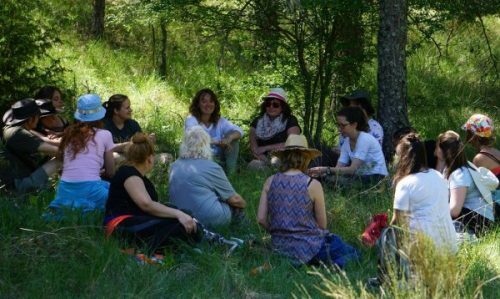 We use a less formal format of Council in Forest Therapy – our circle gatherings draw attention to the present moment, participants’ experiences during the walk, and practising gratitude for the more-than-human world. As a mindfulness practice, Council enables people to become more self-aware and aware of others, as well as their natural surroundings. Each person has a voice and wisdom that should be given the opportunity to be heard and witnessed. Speaking and listening from the heart can connect people in a way that strengthens relationships and builds stronger communities. In Forest Therapy, we recognise that human connection is an important part of nature connection. It helps us overcome the isolation we can feel when we don’t have the opportunity to share our nature connection experiences with others. It’s also a powerful way to reconnect with your community in a world massively absorbed in technology, where regular and healthy forms of social interaction and communication may be strained or lacking. Being part of a community has many benefits, especially for one’s mental and emotional health. Become part of the Forest Therapy community near you by attending one of our walks in central Scotland, see events here.